For thousands of years, the shores of Spain’s Balearic Islands have seen many a different traveler, from Phoenicians and Carthaginians to Arabs and Romans. Modern visitors are better behaved, leaving their battering rams and cannons at home. This improvement gives the islands the freedom to refrain from fortress building, so that they can turn their attention to improving and adding hotels. Where forts once stood, hotels have laid their foundations and there’s been a spate of new hotel activity on the islands, especially on Mallorca (also spelled Majorca) and Ibiza. A familiar name is returning to Mallorca, the largest of the Balearics. Mallorca's legendary Hotel Galatzó Majorca is to re-open next March 1 as a member of Maritim Hotels. The 172-room hotel had belonged to the group from 2007 to 2009, but now it re-opens as a franchise member of the group. The hotel is located on the Costa de la Calma between Santa Ponsa and Paguera, an area famous for the UNESCO-rated Tramuntana Mountains. The hotel’s pool features a sun terrace with Balinese sunbeds. The 1,400-square-meter Mediterranean-style spa complex has a whirlpool, a Finnish sauna, cold and hot water pools, a steam room, a foot massage service and a complete range of themed showers. Restaurants include the main “Mediterraneo” restaurant and the “Vista de Rey” à la carte restaurant. The three bars offer a range of wines, cocktails and other beverages. Mallorca enjoys a balmy year-round climate, which makes it popular with golf and tennis fans. As the home of the world’s top male player, Rafael Nadal, Mallorca is something of a center for tennis. The hotel has five clay courts (two indoor). There are plenty of quality golf courses nearby. There’s also a walking and cycling trail from Palma to Andratx that passes in front of the hotel. 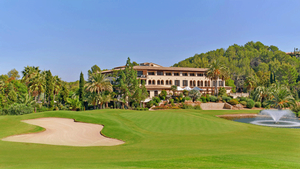 The 93-room Sheraton Mallorca Arabella Golf Hotel reopened after a nine-month, multi-million dollar renovation. The hotel is located next to the 18th hole of the Arabella Golf Course Son Vida – and offers guests free play at 63 holes on four courses (Son Vida, Son Muntaner, Son Quint and Son Quint Pitch & Putt) alongside complimentary shuttle transfers from the hotel. The 142-room Park Hyatt Mallorca, coming in 2015, will be the first Hyatt-branded hotel in Mallorca. Built in the style of a traditional Mallorquin hilltop village, the hotel will overlook the Canyamel valley with views of the sea and the ancient town of Artá. Adjacent to an 18-hole golf course, Park Hyatt Mallorca will also be within walking distance to the Coves d’Artá. The nearby Balearic Island of Ibiza has become something of a center for electronic dance music and the new 493-room Hard Rock Hotel, which grand opens on June 13 as Europe’s first Hard Rock, will certainly tune into that market. The Hard Rock Hotel Ibiza was transformed from two former Palladium Hotel Group properties where Bob Marley himself stayed in 1978 when he played Ibiza. Located on the Playa d’en Bossa, among the best of Ibiza’s beaches, the hotel will feature live music and DJ performances. On June 13 the disco band Chic, alongside co-founder and guitarist Nile Rodgers, will highlight the grand opening celebration. Hard Rock’s Sound of Your Stay program allows guests to have curated playlists, Fender in-room guitar delivery, and professional quality DJ equipment. The resort’s two Michelin star chef, Paco Roncero, oversees Sublimotion, a new restaurant concept which offers a radically different gastronomy experience limited to only 12 guests per night. The hotel is also home the highest rooftop bar in all of Ibiza, The Ninth Skybar. Numerous acts will perform at the Hard Rock Hotel Ibiza’s outdoor concert terrace. The line-up this summer includes R&B singer Robin Thicke, Snoop Dogg and others. The Hard Rock Hotel Ibiza is offering opening packages offering savings up to 40 percent off best available rate. ME by Melià will open the ME Ibiza in June and the ME Mallorca this month. ME Ibiza will offer direct boat access and an on-site rooftop bar/restaurant. Located on the bay in Santa Eulalia, ME Ibiza has 200 rooms, including 21 ME+ suites, some of which have private Jacuzzi’s and swimming pools. All rooms have bathrooms with rain showers and premium amenities, including organic brand Apivita, as well as access to the hotel’s integrated digital media hub. The hotel has two pools, an on-site fitness center and a roof top SkinC spa. Located outside Calvià, the 246-room and 78-suite ME Mallorca is situated on the beach front in a grove of pines and Mediterranean palms. The resort is located some five miles from Puerto Portals and five miles from the super yacht marina at Port Adriano. The hotel will feature a SkinC spa, a pool and more.